I have the opportunity to start 3D printing pieces for my employer who will pay me for them. I've got the quality down for the most part except the top layers. There are gaps in the filament that is put down and the only way I've been able to get it to 'fill in' is manually increasing the Flowrate when it is doing a top layer. Changing the Top Solid Infill value in the advanced section has not given me the results I am looking for. 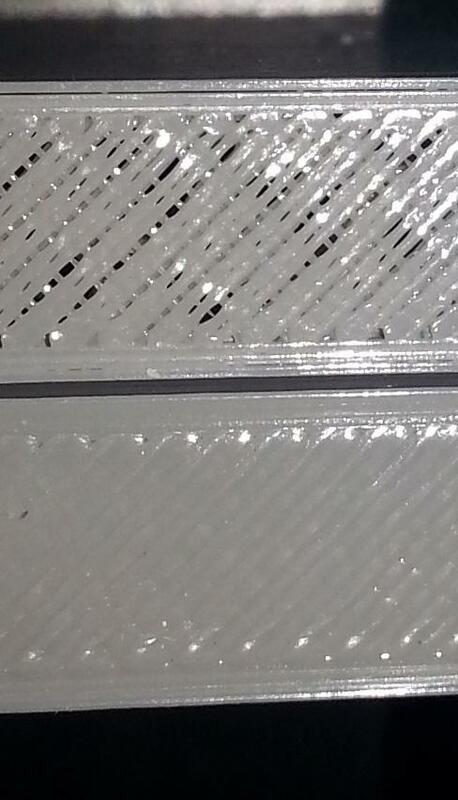 Slowing down the speed at Top Solid Infill helps but not enough to close the gaps. There can be no gaps in the top layer. How can I have the flowrate increase on certain layers only? Attached is an image to give you an idea of what I'm dealing with. You can't change flowrate per detail (except briding) and it is not required. If you get th etop image, your flowrate in total is too low. You also see the perimeter have a gap. I guess you tried wall thickness clibartion and reduced flow rate until it matched? Well sometimes you come too low with this calibration.Especially if you measure more then one layer alignment can change measured tickness.